Just Jingle: *CLOSED* Gourmet Rubber Stamps Santa Blog Hop and GIVEAWAY! *CLOSED* Gourmet Rubber Stamps Santa Blog Hop and GIVEAWAY! We have some fun stuff for you today! The Design Team has come together to offer you some fun Christmas inspiration and lots of GIVEAWAYS, too! I decided to go a little non-traditional for my card. I pulled out the totally fabulous In the Parlor set. The chandelier has always felt quite festive to me, so I just HAD to use it on a Christmas card! 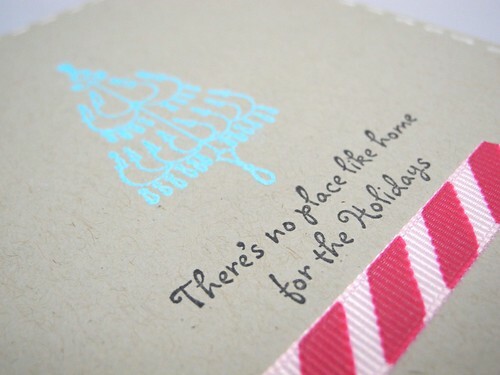 I stamped and embossed the image and then stamped the sentiment from the Holiday Lane set. A bit of May Arts ribbon adds a punch of pink, too! YAY! Love color punches! And today one of you will win the In the Parlor set that I used on my card! YAY for giveaways!!! Here is the entire set. To enter to win, simply leave a meaningful comment on this post. The winner will be drawn on Monday, so comments will be open Saturday and Sunday. Don't forget to check out my other current giveaway, here, as well! Happy Saturday, folks!!! How awesome of a card, simplicity at its best. Really loving those colors you've used. When I first saw this I thought it was actually a more modern looking Christmas tree....love how this turned out, great bit of ribbon too! You make lovely cards! I love the colors! thanks! this is fantastic, I miss designing with you girls! Happy Holidays! You are so creative, Jingle! I don't know if I would ever think to use that chandelier as a Christmas tree, but it fits perfectly! Great job once again! What a fun set of stamps! I love your use of them. I love your embossing and CAS style! I love when people use stamps in a way different than the design was meant. Using the chandelier as a tree was genius and this parlor set is terrific! I could give it a very nice home :-) Thanks for the chance to win! I love how you mixed the two sets! What fun! I love the funky look of the card- so retro and yet so elegant. It made me think of the movie Breakfast at Tiffany's with Audrey Hepburn and George Peppard. And what you could do with that Chandelier..
Love the non traditional colours...anything on kraft makes me smile and you card did too! Great card! and thanks for an awesome giveaway! Wow, that's thinking outside of the box! Love it! This is gorgeous, Jingle! I love how you saw the tree in the chandelier and the color combination is so fresh and cool! Awesome card love the embossing....the only measningfull comment I can think of is about those poor babies killed for no reason. I hope their family will be OK.
Super cute card! Great use of the chandelier stamp! wow I love how you took an image that so many could see as just a chandelier and you turned it into a perfect holiday image in fun funky colors! This is gorgeous! I love the aqua embossed image! I think aqua is such a fresh color for Christmas! The Christmas tree reminds me of a Hannukkah candle holder... Thanks for the giveaway. Merry Christmas and Happy New Year. May the coming year bless you and your family with everything that your hearts desire. Simplicity is good... I love the PTI On My Couch set, maybe I should branch out?? The colors are really popping off that card! I do like the blue chandelier. Such a playful use of an image. LOVE your card! It's very unique and cool! I love the card and the set! Just discovering your blog...thanks for sharing the creativity! love the sayings in this set, thanks for a chance to win! How fun to use a chandelier stamp in lieu of a Christmas tree! It's very chic! The parlor set is great.I like everyone being kinder to one another this time of year. I love the pop of color and how the image is such a focal point with hte white space. adorable. What a cute set, love the mod scoop chair. Cute card, who doesn't love red with turquoise.